VIEWS FOR MILES! VERY PRIVATE! LOFT THEATER W/PLAY AREA! FREE WIFI! NETFLIX! 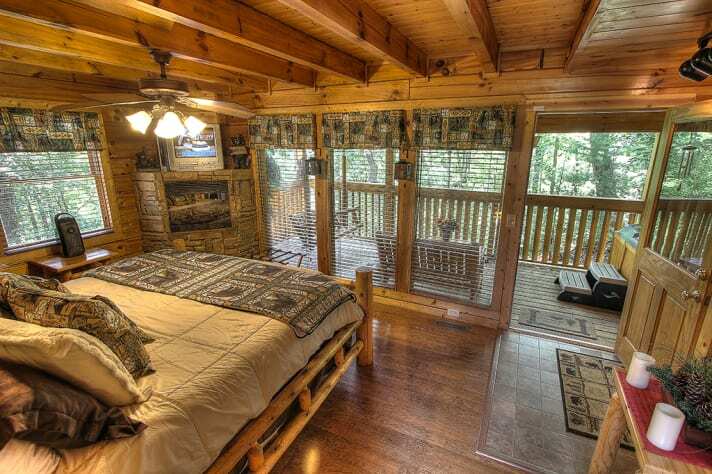 Black Bear Bungalow offers an incredibly charming and private Smoky Mountain experience. 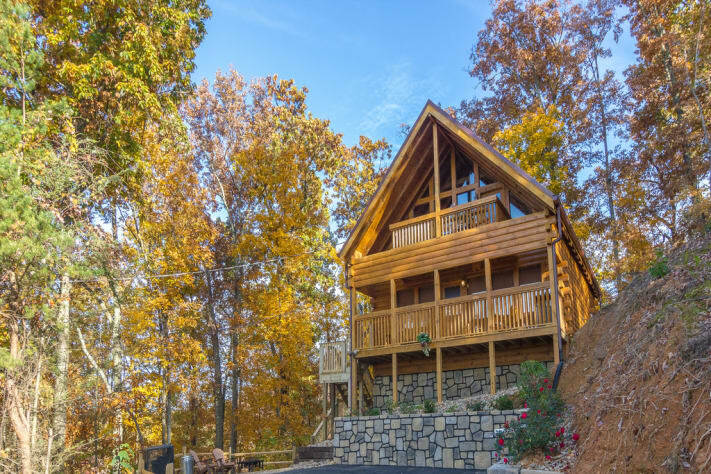 This 2-story real log cabin has been extensively renovated and lets you relax in style with incredible mountain views from both front decks. 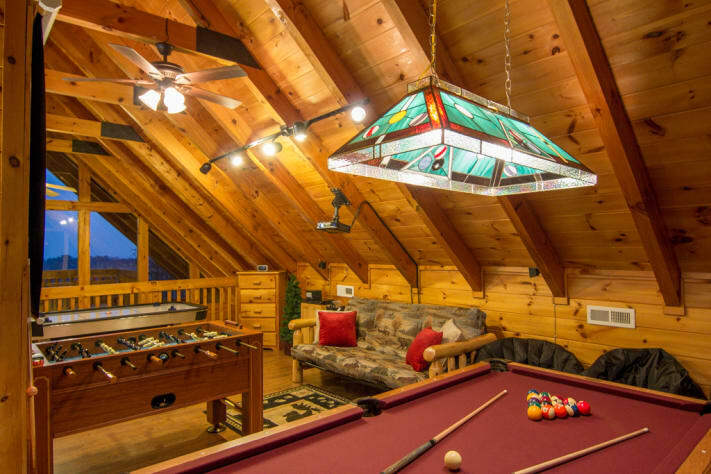 A full size pool table, air hockey, foosball and more await you. 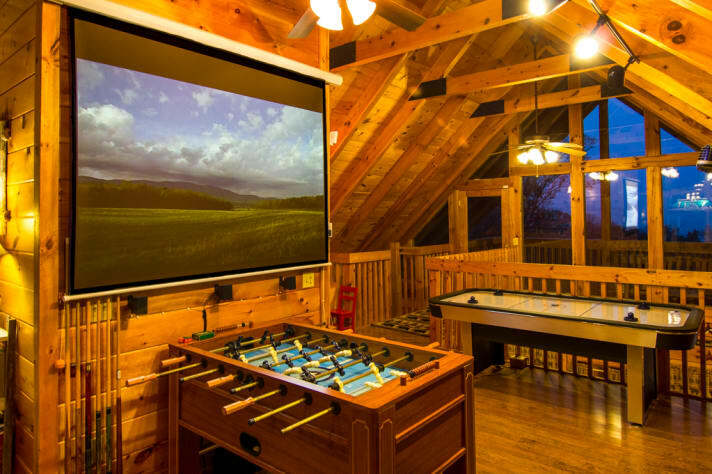 Even a 72 inch projection TV and a play area for young children (they will love the toys and the kitchen for playtime). There is also a Game Cube with 20 or so video games. 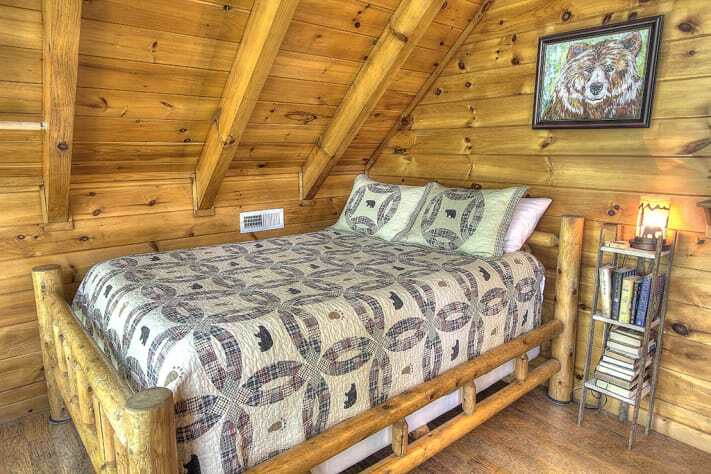 Black Bear Bungalow is located on a quiet street amidst tall trees. 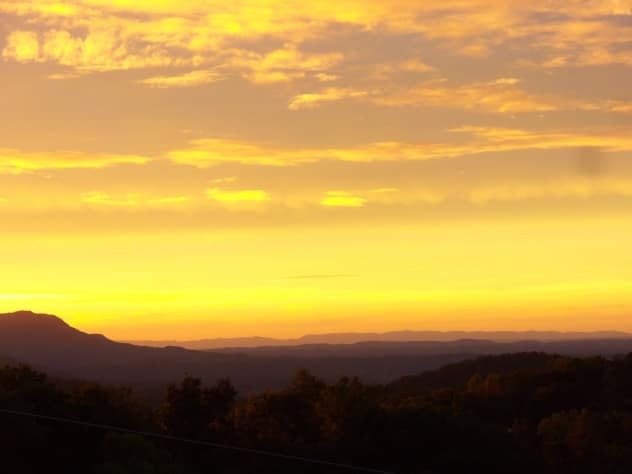 The view from both front decks is stunning and you can see the lights of Pigeon Forge at night. During the summer, watch Dollywood's nightly fireworks show! No neighbors to the left or right (or in front, or back of you, either), you will enjoy the peace and quiet of the mountains every day. From the moment you arrive, you'll know that this is your special place. 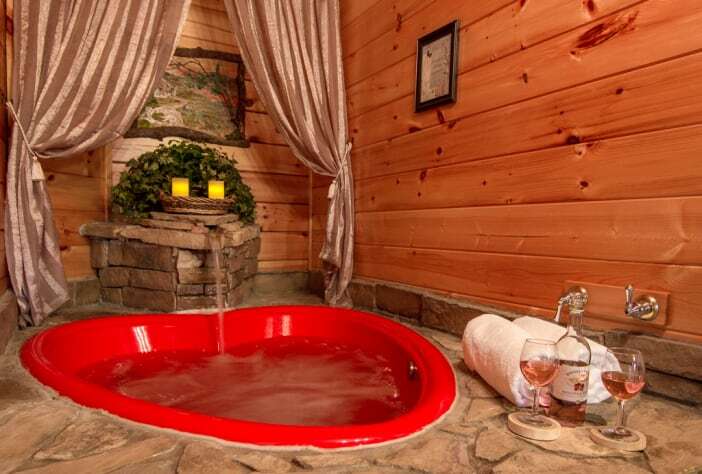 There is a heart-shaped Jacuzzi with waterfall; two fireplaces--one in the living area and the other at the foot of your king bed. On the back covered deck is a large hot tub, swing and more seating. 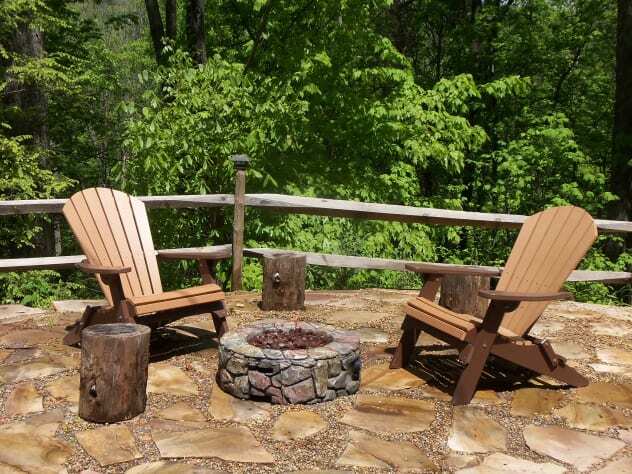 You will love the sounds of nature and the privacy of having it all to yourselves. 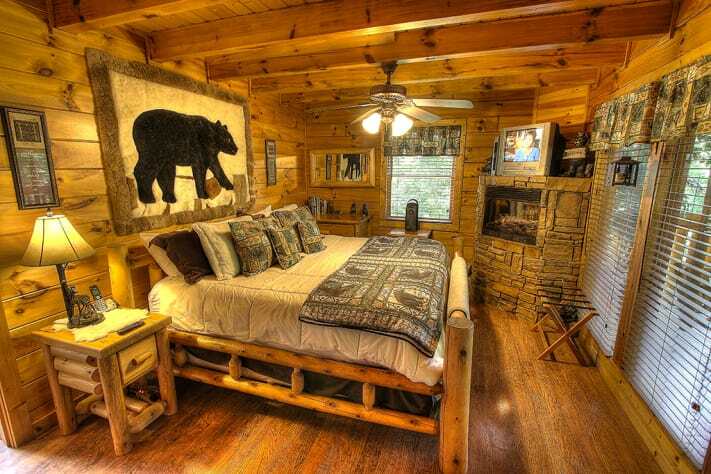 Black Bear Bungalow is only a couple of miles from the parkway, or as the locals like to call it, The Spur. 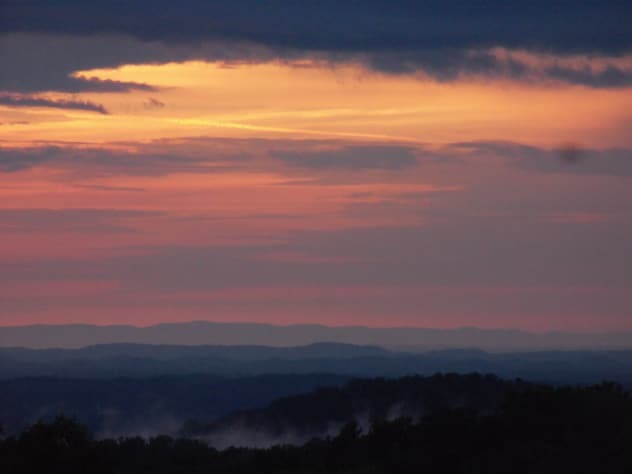 It is centrally located in between Pigeon Forge and Gatlinburg. In a few minutes, you can be in either town. 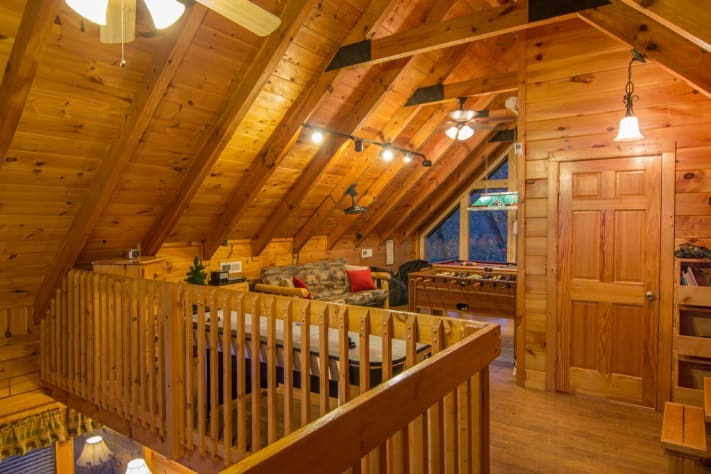 The cabin was extensively renovated and is now ready for guests! So many things are new we can't list them all here, but look at the photos and you can see a lot of attention to detail. New hard anodized cookware, new bedding and linens, new stairs, driveway, security system and more. 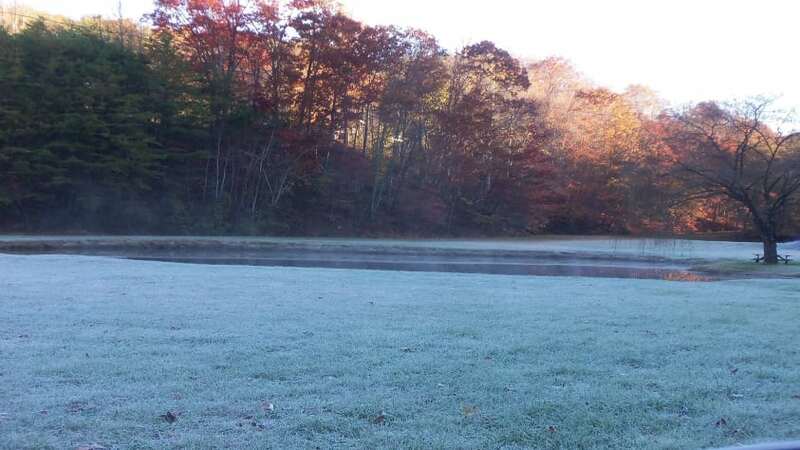 Black Bear Bungalow is not just a couples retreat--it is perfect for families, too. 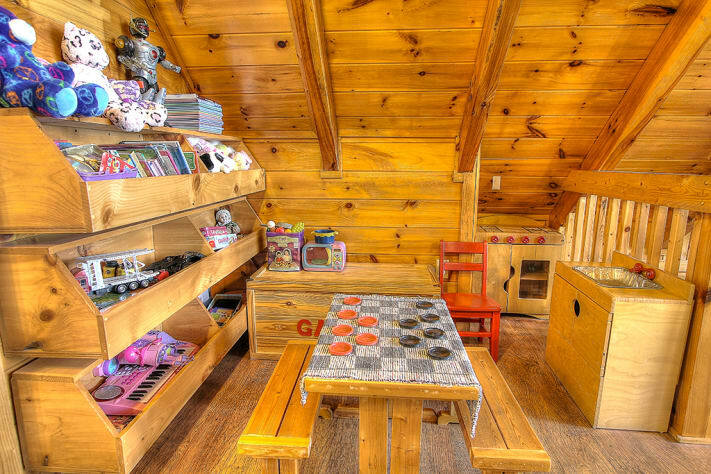 The game room has so many things to do, your kids will be busy for hours up in the loft. 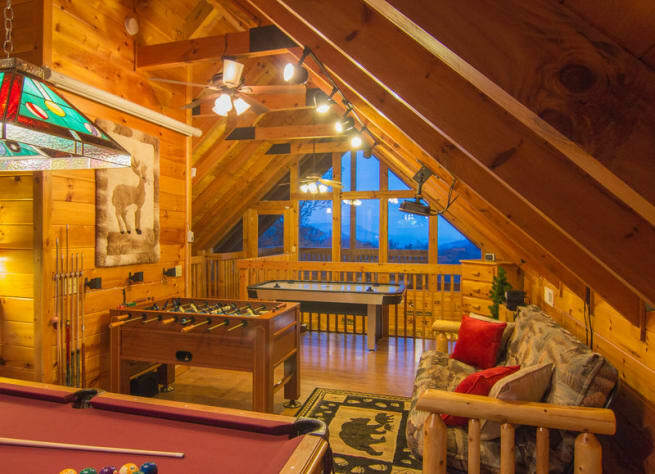 Whether it is just to celebrate an anniversary...spend a long weekend with old friends...or bring the kids to their best vacation ever, Black Bear Bungalow is the perfect choice. 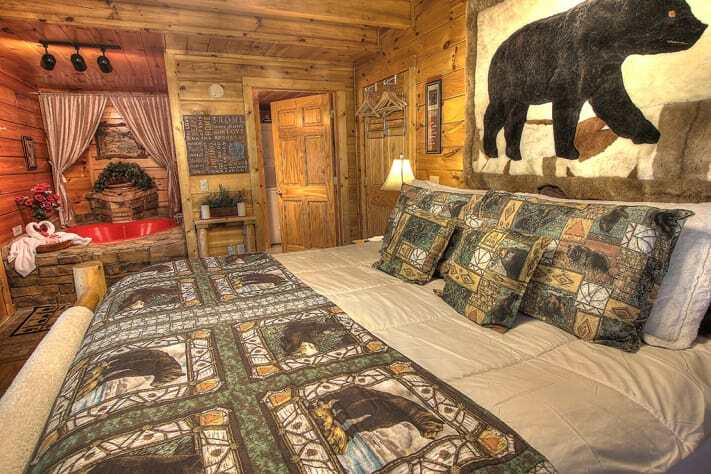 This was our first stay at Black Bear Bungalow and we highly recommend this cabin. We stayed in Majestic Mountain Memories in the fall and though it is wonderful, we like B.B.B., even more. 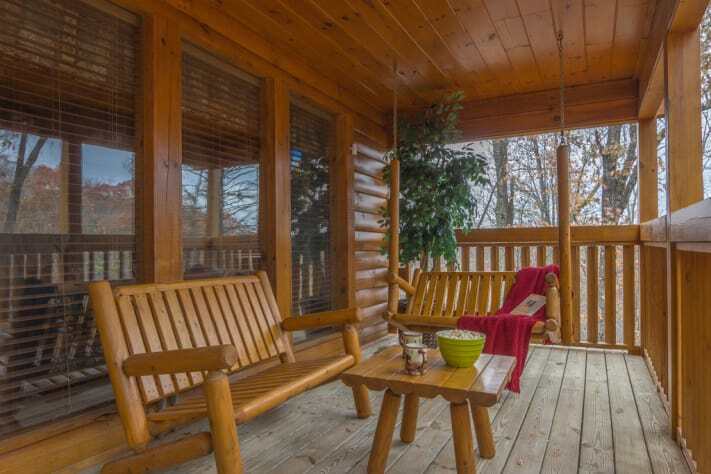 It is roomy, private and has three great porch areas for outdoor viewing and relaxing. We could appreciate the pretty roses in bloom when we drove in and also meeting owner Dave- such a nice guy! Dave offered to leave clippers out so we could cut some roses if we wanted. Great location, as it is private, yet close to shops and restaurants. We plan to return soon for another stay. 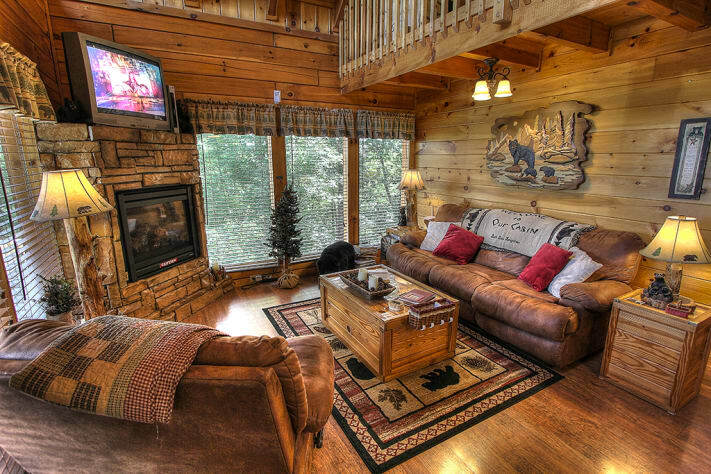 This cabin is wonderful. 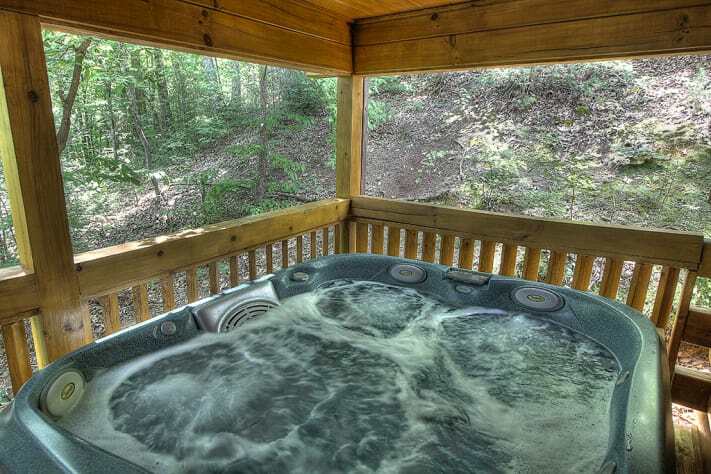 We love that it has just about everything... including a hot tub and game room. Also it’s private, but close to everything in town. This is our second year renting it and we look forward to making it a yearly tradition to vacation there. You don't even need to leave! 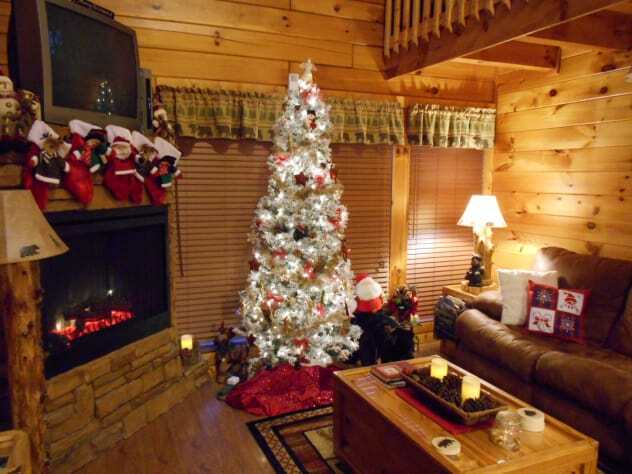 My husband and I booked our vacation at this cabin as a Christmas gift to our children. We stayed in early January and we were lucky enough to see snow our very first morning waking up in the cabin. It is absolutely magnificent! The veiw is spectacular. 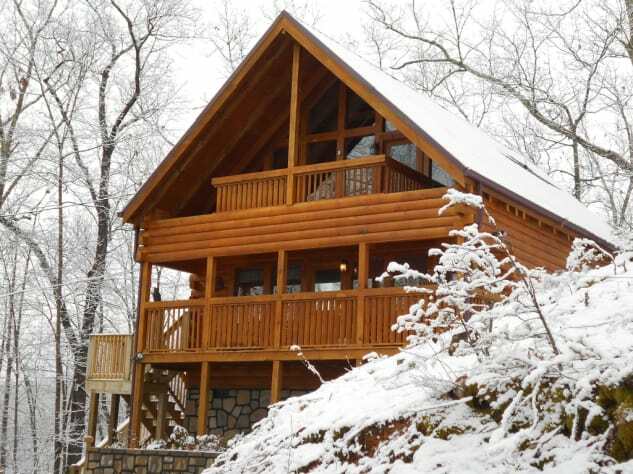 It is literally a 10 minute drive into Pigeon Forge and very close to Gatlinburg as well. There was plenty to do inside and out of the cabin. 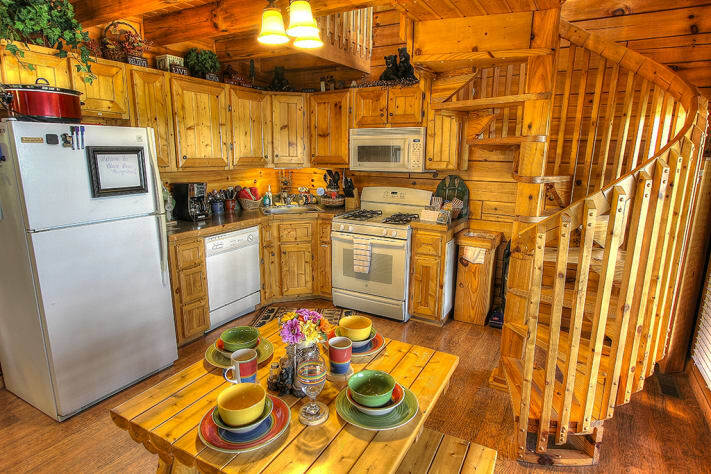 It is fully equipped with everything one might need and there is so much to do and enjoy right there in the cabin that you don't even mind staying in! We spent time in the jacuzzi, played for hours upstairs and watched tons of movies on Netflix. 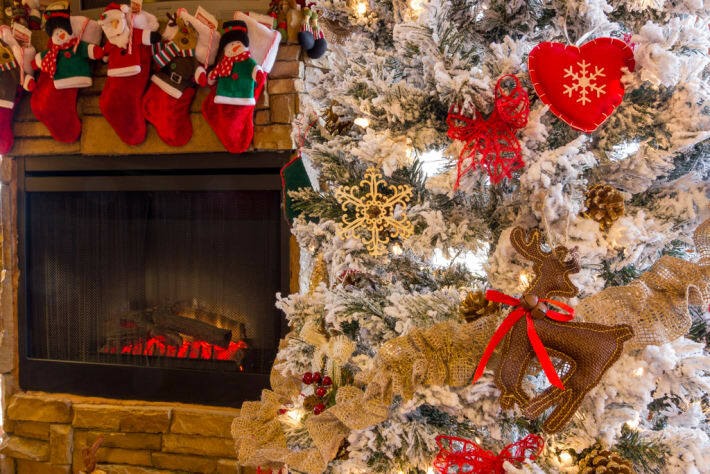 The fireplaces are gas, which was a wonderful surprise and we kept them on all the time. 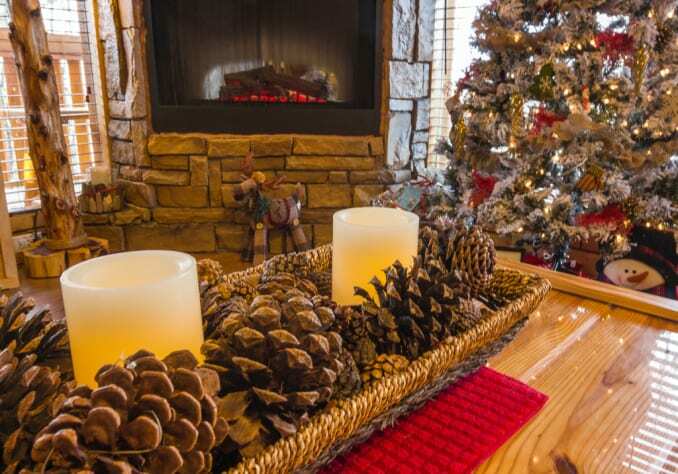 It is beautifully decorated and the owner is amazingly friendly and helpful. Great family and kid friendly place! We spent most of our time relaxing and enjoying the cabin. There was always something to do. My kids want to come back here ever time! It was great!